'From a retail investor's perspective, therefore, it is essential not to get swayed by the short-term correction in the equity market and macro noise, and stay the course with their long-term financial plans,' notes Ashwin Patni. India once again finds itself caught in a global currency market turmoil. The rupee has fallen a little over 12% against the US dollar this calendar year. While the depreciation had been steady in the first half of the year, the second half saw a sharper fall. The challenges within the currency market have affected sentiments in other markets as well -- both equities and fixed income. Specifically, the equity market -- after seemingly holding firm in the first half -- has seen a sharp correction in the past two, three months, mirroring the acute phase of the currency depreciation. India is no stranger to currency depreciation. We have seen sharp sell-offs a few times in the past couple of decades. We had last experienced a large currency depreciation episode about five years ago in 2013 caused by the US Fed's talk of tapering bond purchases. The rupee had then corrected more than 28% against the US dollar. Looking at the historical correlation between rupee depreciation and the stock market can give us an idea of how the current situation can shape up. Analysing the Real Effective Exchange Rate over time gives some clue about the current sell-off. The rupee had rallied sharply during 2016-2017, and as a result, had become overvalued. The over-valuation started reflecting in some loss of competitiveness for the economy -- as evidenced by a rising current account deficit. This coupled with issues including the US rate cycle, a broader sell-off in emerging markets (EM), rising crude oil prices, and an overall risk-off sentiment, precipitated the sell-off in the rupee in the current year. Also, while the sell-off has been sharp against the US dollar, when compared with other currencies the rupee has held up better. The extent of the out-performance during 2016-2017 means that despite the current sell-off, the rupee remains one of the top performing EM currencies over the past five years. If we step back from the current market environment and look at the rupee against the US dollar over the long term, we will see that the Indian currency has consistently depreciated vis-a-vis the US dollar over the past 20 years. Over this period, the annualised depreciation rate comes to 3% a year. When one looks at the trend in detail, it becomes clear that the depreciation has not happened in a smooth line. The currency markets tend to be stable for a number of years and then witness a sharp depreciation episode (much like the current one) that resets the currency's trading level. Let's isolate periods during which we witnessed sharp currency sell-offs over the past 20 years and examine how the equity markets behaved during those times. Also, let us see how the current episode compares with these older data sets. 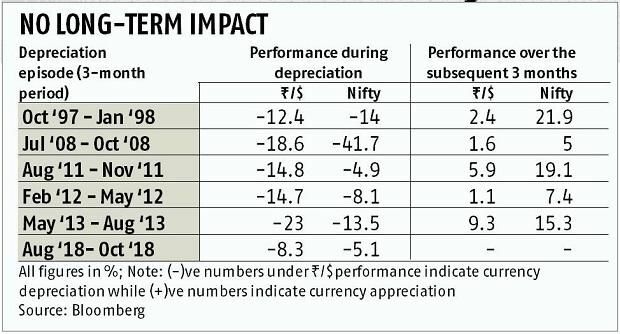 Since 1998, there have been five instances where the Indian rupee has lost at least 12% (against the US dollar) within a period of three months. We plotted the stock market along with the currency movement during these phases, also included the market's behaviour in the three months after the currency sell-off. Four trends are clearly evident from the historical data. One, periods of acute currency depreciation are generally accompanied by a sell-off in the equity markets. Two, except for the Global Financial Crisis (GFC), these episodes saw Indian equities fall by 10% to 15% in rupee terms. The GFC sell-off was, of course, much sharper. Three, interestingly, the equity market bounced back sharply (in rupee terms) in the subsequent three months once the currency stabilised. The exception seems to be the GFC where the bounce back took longer. Finally, the recovery in stock markets does not seem to be affected by whether the currency bounced back as well or whether it stabilised around its lows post the sell-off. Over the long term, it's inflation and growth that determine the trajectory of the currency. In the case of India, the persistently high inflation over the years meant that our currency had to depreciate over the long-term to maintain its real value. In the short-term, any relatively open emerging market that runs large trade deficits that get principally financed through more volatile portfolio flows (as in the case of India) opens itself up to periods of sharp currency sell-offs related to global sentiment shifts. Equity markets are driven by sentiment in the short-term but fundamentals in the long term. We have seen that over the medium to long-term currency movements have not had a significant effect on corporate earnings, that is, the fundamentals of the market. 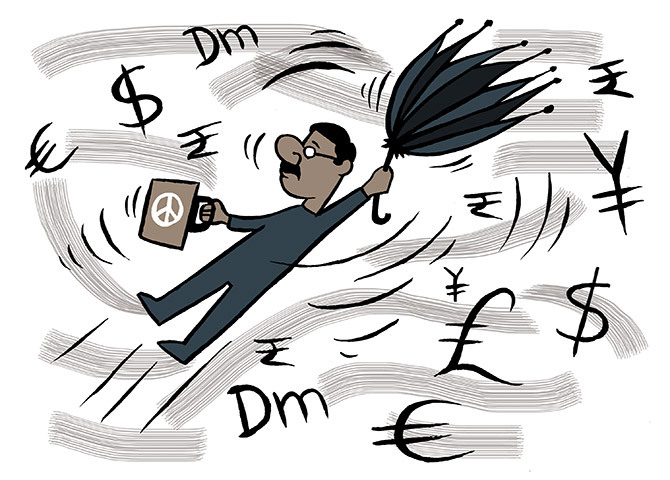 However, in the short term, currency depreciation affects sentiment, especially for foreign investors, but also for the domestic ones, as media commentary focuses on the immediate negativity. While these have led to a short-term reaction in the equity markets, history seems to suggest that the impact is more transitory and the market moves on once the currency stabilises. From a retail investor's perspective, therefore, it is essential not to get swayed by the short-term correction in the equity market and macro noise, and stay the course with their long-term financial plans. These episodes also illustrate the importance of risk management in investment portfolios. Strategies that can withstand such shocks and generate more sustainable performance should be valued and preferred over other fairer-weather strategies. Ashwin Patni is the head (products) and fund manager, Axis Mutual Fund. DON'T leave unutilised funds in your trading account!